Whether your project involves tank heating, vessel heating or any combination of these, CompuTrace VT has what it takes to help design your heat tracing system. CompuTrace VT provides the user with the capability of designing heat tracing systems utilizing Thermon's compliment of constant wattage, both series and parallel resistance, self regulating and power limiting cables. 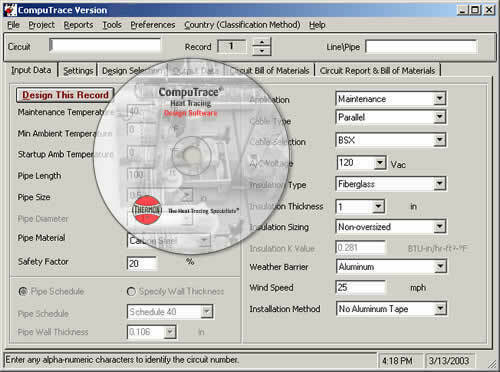 CompuTrace VT allows the user to perform designs in compliance with four globally recognized electrical standards. The program performs heat up calculations using any of Thermon's cables. When the designer has finished his session, there are five report formats to choose from. All reports can be exported to a Microsoft Excel compatible file for electronic file transfer or customization.